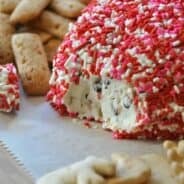 Need a cute Superbowl treat to bring to the game this weekend? 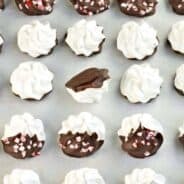 These are so easy to make and delicious to eat! They would look perfect on the dessert table! Just like the classic, Little Debbie Oatmeal Cream pie, except these are made with chocolate. So soft and delicious! In large bowl, beat Crisco, brown sugar, granulated sugar, molasses, vanilla and eggs. Add flour, salt, baking soda, cocoa and cinnamon. Mix in the oats. Drop by ONE tablespoon onto a parchment lined cookie sheet (shape into an oval). Bake 7-8 minutes in a 350 degree oven, until just starting to brown around the edges. DON’T OVERCOOK! 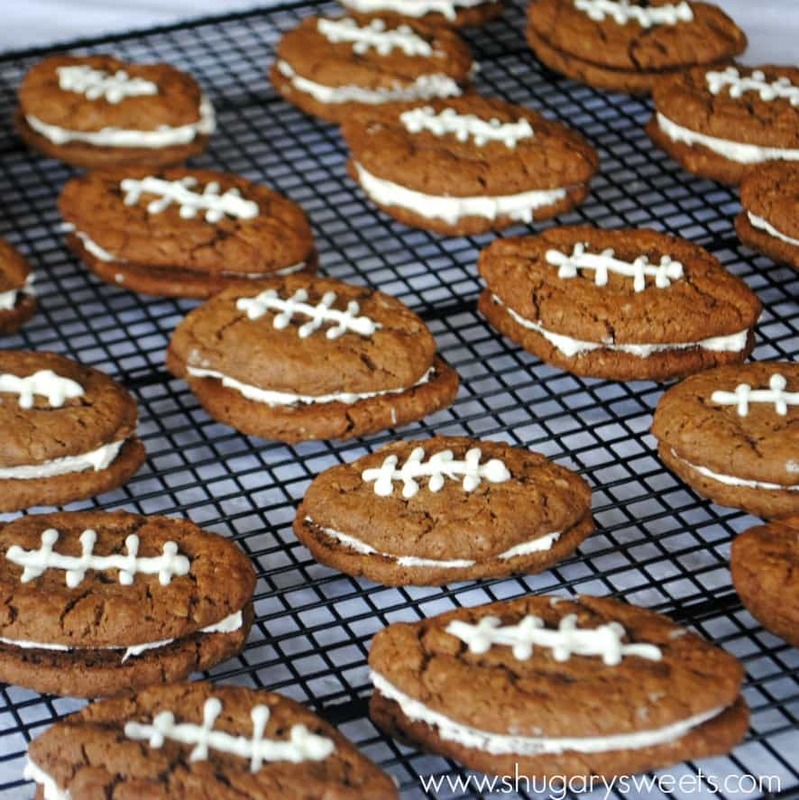 Pinch edges of cookies into a football shape if they have rounded too much. After cookies have cooled, combine hot water with salt and mix until salt is dissolved. In large bowl, beat marshmallow fluff with Crisco, powdered sugar and vanilla. Beat on high until fluffy. Add in salt water and mix until well combined. Spread filling on one cookie and press second cookie on top. Using melted chocolate, drizzle the top to look like a football. Allow to set about ten minutes. Enjoy! Very cute & my kind of football food! I’m a sugar girl and I hate all those salty football snacks. This is perfect! These are perfect for the super bowl! To cute! Now I just need to throw a party and make them! 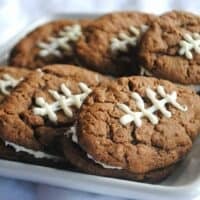 Definitely my kind of super bowl snack:-) Oatmeal cream pies are my favorite little debbie…I love that you made them chocolate and football shaped!!! You are awesome!!! Who’d a thunk it? Brilliant!! These look awesome. So cute & they look yummy! Oatmeal cream pies by Little Debbie are pretty much the best thing ever. Til I saw these. Amazing! Do they taste similar to Little D’s OCP’s? These are SO CUTE! Love love love them! Way good idea for superbowl! These are adorable! And, oh, so good too, I bet. Yummy! I love these Football cookies! They are perfect for this weekends big game! I’d love if you would drop by and link up to my Super Bowl Eats and Treats Party! How perfect are these!! This is the exact reason why I love football…the food!! These are so adorable – and I could tell myself – it has oats – it’s healthy! These look so adorable! Perfect for the Superbowl! I remember eating something really similar to this when I was younger, so it’s definitely bringing back some yummy memories 🙂 I love this, great job! YUM! These sound delish and how perfect for the Super Bowl! Pinned! Thanks for sharing! I saw these on pinterest. I should have guessed they came from your kitchen. Love! So cute they almost make me wish we cared at all about professional sports. Oh man, these are dangerous. They look so good! Thank you so much for linking these up at Weekend Potluck! They are so adorable. I just featured them on facebook! If you wouldn’t mind, please post a link back to Weekend Potluck or grab one of the linky buttons. Thanks again! Have a great weekend! These are adorable – I’m going to try to make these for my husband – he would love them! These are so fun!! Love it! I featured your cookies on my blog today, feel free to stop by & check it out! 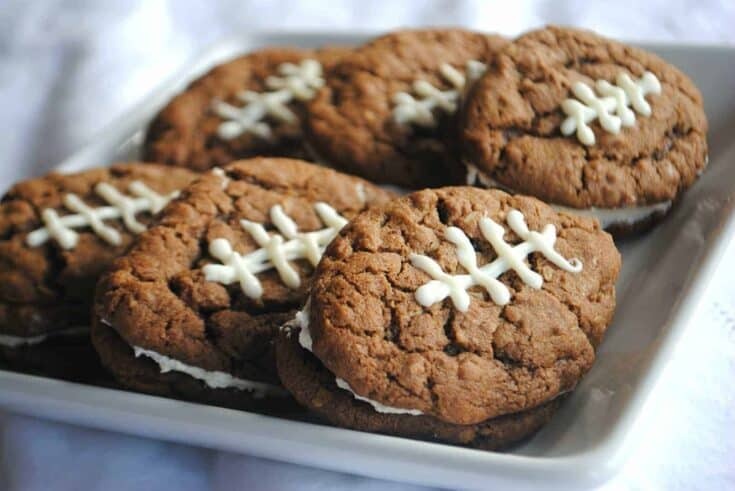 OMG — these are the cutest, and tastiest looking football treats I’ve seen! Spotlighting your recipe on my FB page today! These are soo adorable! Have to make them next year for superbowl sunday for sure 🙂 or maybe sooner, I don’t think I can wait that long to try them !! these are so super cute! thanks so much for the yummy recipe! How fun! 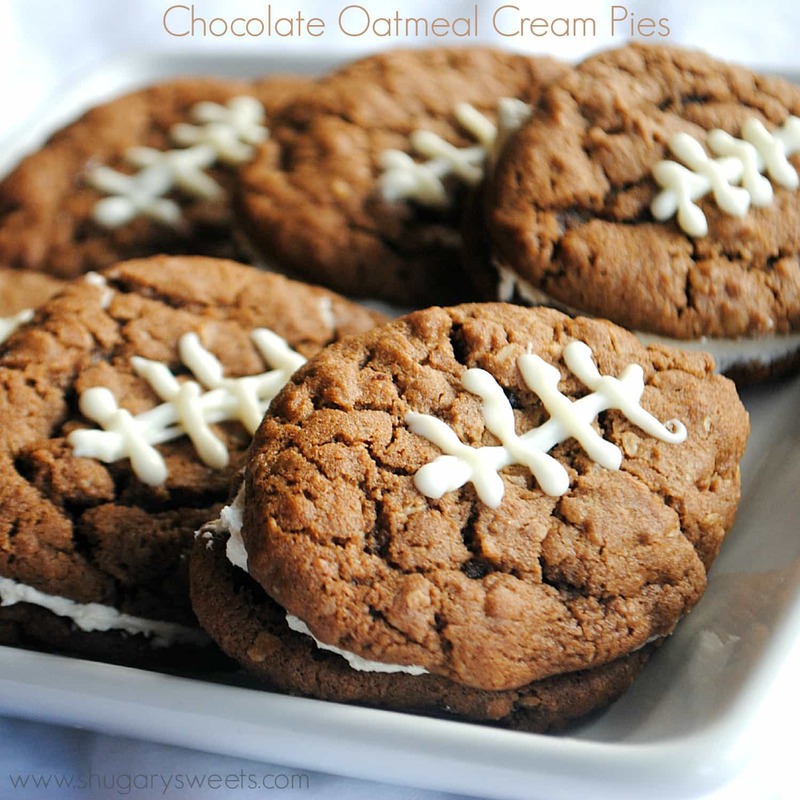 My husband loves oatmeal cream pies; I’ll have to give these a try! Thanks Mackenzie. they are quite good, and fun too! I wonder if there is a way to convert these to gluten free so I could have them and my toddler son too! We’re allergic to wheat! These look amazing, and I can’t wait to make them for a Super Bowl Party this weekend. 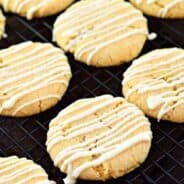 Has anyone tried this recipe with regular butter rather than butter-flavored Crisco? Just wondering if the substitute will alter the way the cookies come out. Thanks! Hi Kim, butter will most likely make these a little flatter (and spread more). You can try using half butter, half margarine. Let me know if you try it! Thanks Aimee! I was making them for a party and didn’t want to take any chances, so I just went out and bought butter-flavored Crisco. They turned out perfectly! I made 1 1/2 batches and they were ALL GONE before we left the party. Yay! Thanks so much for this recipe. We just were invited to a Super Bowl party..I might have to give these a try! Yum! Glad to hear it 🙂 ENJOY! Question… I see the yield is 20. Is that 20 sandwich cookies, or 20 individual cookies (so only 10 once they’ve been put together). I’m trying to scale for a party. Thank you! I was able to get about 45 cookies out of this recipe with a #50 scoop. That will yield a little over 20 sandwich cookies. The #50 scoop is a nice sized cookie. But two of them in a sandwich cookie with filling is a large portion. I’ll use a smaller scoop next time. I’ll try a #60. Pinning this! Can’t wait to make it for a football party! Butter flavored crisco is pretty nasty tasting stuff. The first time I made these, they tasted like they had coconut in them. The second time I made them I replaced the butter flavored crisco in the filling with equal parts regular crisco and real butter. That made a big improvement in the taste. Next time I’m going to completely get rid of all the cricso in both the cookies and filling then substitute with butter. I would really like to make these but there are no directions. Even when I click print, it just says “directions” with nothing underneath. Did you ever get the directions? Same as the last comment. No directions. I would love it if you updated the post with directions. Thanks! Yes, I understand how to do that. However, whether on my mobile device or on a computer, after the list of ingredients, it says “Directions:” and then that is the end of the post. No directions are given. Please review your page and see for yourself. I would still like to make these someday…so if you could send me the directions, that would be great! Thanks! Oh bizarre. Not sure why it did that. I just reset the post and it appears to be working now!